Is your client in need of a good quality DSP zone mixer but doesn’t have the budget? Could you use a product that allowed zone paging for a bar and restaurant and would allow you to mix a small band in the same box? Look no further my friend! You can even use the ipad app to walk the venue while you set up zone routing and levels. Engaging the paging scene ducks all the inputs by 10dB and routes the paging mic to all of the outputs. DCAs control your output for each zone. Engaging the paging scene ducks all of the inputs by 10dB (except for the paging mic) and routes the paging mic to the all of the outputs. Like a Page-All scenario. You can modify this to fit your various routing needs and save them as new presets. The mic inputs are all low-cut at 120Hz and they have a compressor on them at 4:1. This will make the paging mic a bit more forgiving for various users. Finally, all of the outputs have some processing applied. They have an 80Hz Low Cut, a 20:1 limiter set at 2dB from clipping and Delay is on for each output but set to 0ms. There is also a graphic EQ engaged on each output and is set to flat. To set up your mixer, load the presets in the Zip file at the link above. Plug in your sources. Adjust the delay and EQ on the outputs as needed. (if you are using a system with sub woofers, you may also need to adjust the low-cut filter) Set the gains for your sources and the paging mic. Then finally set the output levels to each zone. 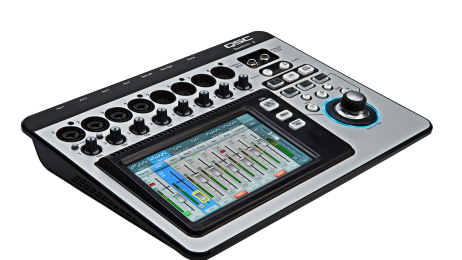 Don’t forget the rack-mount kit if you need to tuck the TouchMix neatly away in a rack. Side Note – If you are looking for a good paging mic to use in this scenario, a Sennheiser e835s or Sennheiser MEG14-40 with a MAT133-S push-button stand are both great options.